Decorate your home with style and color using this set of bookends featuring a green and brown finish. 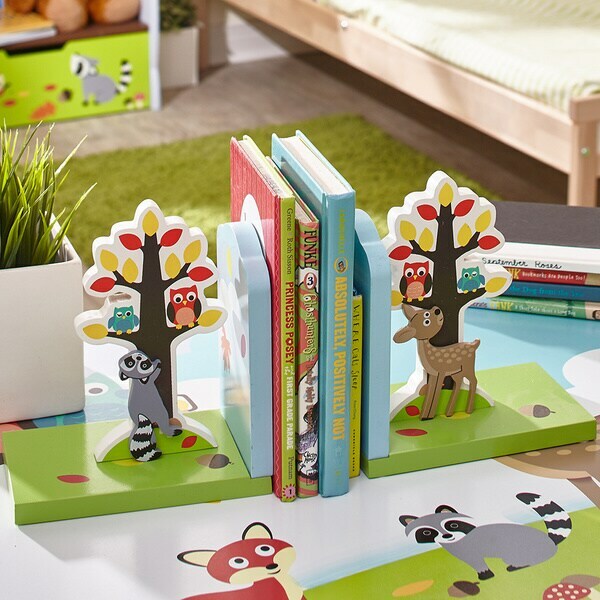 Pull back the pages of your favorite bedroom time read and then secure it for safe keeping with these wooden hand painted carved bookends from the Enchanted Woodland Collection. Sky blue bookends with cheerful clouds and falling leaves adorn the edges and friendly forest animals dance along the edges of the bookends. These are large bookends. The match the Enchanted Woodland bookcase. The book ends are adorable. If both are used on one shelf of the coordinating bookcase, there would hardly be any room for books. It is best to use each one on a different shelf. I highly recommend both items. As a set, they lend a lit of cuteness to a child's bedroom. "Is this painted with kid friendly non toxic paint?" Hello Wendy, these bookends are painted with water based, non-toxic paint . Thank you for shopping with us.